So happy to tell you that, my first attempt of baked rice was a success! It was easy to assemble. What to do… I was a little too lazy to make anymore cheese food that requires many cooking steps, and hence, baked cheese rice has become my option, for tonight’s dinner. I find it very simple to cook, despite the fact of first attempt. This baked rice I’ve made from scratch, was using raw rice grain instead of the pre-cooked. It needs precise amount of water to be added to it in order to yield a perfect rice texture. Its baked rice cannot be too dry and hard to chew, or too soft and wet like porridge. I had my first baked-from-raw-rice dish successfully made. 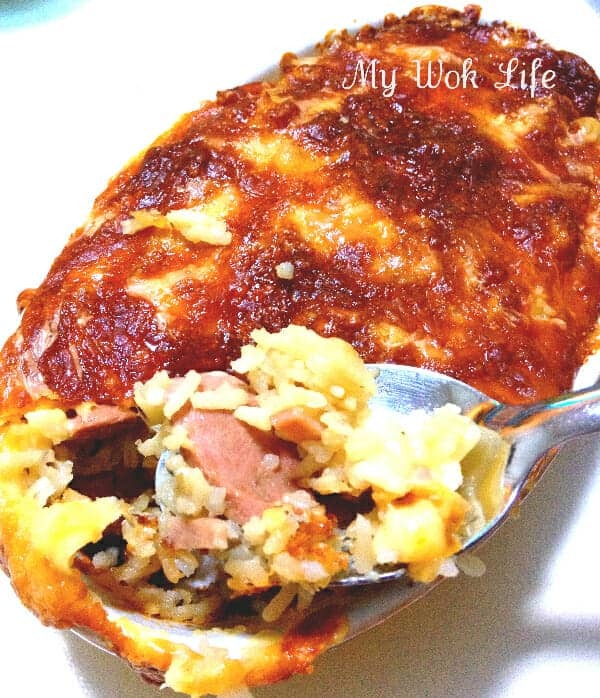 However, if you are looking for a creamy and wet baked rice dish that you have eaten in those Hong Kong or Western Cafes, this recipe probably not what you are looking for. My rice wasn’t baked in wet cream sauce, mine was just moist enough for the palate. Yes, not creamy at all, raw rice to bake usually doesn’t yield creamy rice.. I don’t use the Campbell cream soup in this recipe, neither creamy pasta sauce nor any heavy cream was used here… I preferred sour cream in this recipe (at least for today’s). So, if you ain’t a creamy saucy person, this recipe would be perfect for you…. Well, if you want baked rice with creamy sauce, pre-cooked rice, and probably the Campbell mushroom cream soup, have to be used. I will bake that to show you next time. One more thing, to make it more cheesy, I used 3 types of cheese, just to satisfy her craving. Ok, try this for now, if you like! 1) Heat pan with olive oil over medium fire. Melt butter. Sauté onion till soften and aroma released. Add and sauté mushroom till lightly browned. Then, add and sauté sausages and ham. Now, add garlic. May add more butter, if necessary. 2) Add rinsed rice grain, followed by half the chicken stock. Stir fry to combine. Reduce heat to low fire. Add milk and sour cream, stir fry for 1 – 2 minutes. Sprinkle salt, sugar and black pepper. Pour in the balance chicken stock and stir fry to combine all, for about 1 – 2 minutes. 3) Scoop and portion out the semi cooked rice mixture into two porcelain baking dish. Top to cover the entire dish with generous layer of Cheddar cheese, sprinkle Parmesan cheese, and lastly, Mozzarella cheese. 4) Bake in preheated oven for 30 – 35 minutes, at 180°C. Do not burn the cheese. When the cheese is browned enough (probably takes about 5 minutes to melt and brown), simply turn off the top heat and continue to bake with only the bottom heat on. Otherwise, I’ll suggest you to try wrapping up the top with aluminum foil before baking, to prevent burning of cheese, so as to retain moisture, if you do not want the cheese to appear too dry for nice mouth feel. A generous serving of my baked rice counts about 550kcal. Tips: Adjust the amount of cheese to your preference. * The cup for right amount of rice is measured by the usual rice measuring cup. * For the choice of cheese, choose whatever type you like. I chose Cheddar for its aroma and smooth mouth feel, Parmesan for its stronger cheesy flavour and Mozzarella for its sticky pulling effect. Most of all, they are the most common and easily available ones in the market. I took about 40-50minutes to do up the bake. The baking duration alone occupies 30-40 minutes. To expedite the whole process to play safe for your home-Econ, you may try using cooked rice to do so. That way, you may reduce baking time to just 15-20 minutes. where can I get Sour cream? never use this cream before. Sour cream is easily available at major supermarkets. Go check out the chilled compartment where they shelf the butter and cheese bar and fresh cream. I usually get it at NTUC Finest or Xtra. Also sure cold storage, Giant, Carrefour and other supermarkets sell, too. Sour cream is the cream we always eat when ordered baked jacket potato. The restaurant usually top it on the potato together with butter and sometimes, bacon, too. Thank you for trying and glad to hear that yours turned out great to you. It motivates me. What are the equipment needed for this recipe? I tried for the first time too and my family loved it. My 5-year old daughter couldn’t get enough. Thank you for sharing this!!! Great! Thanks for liking it. 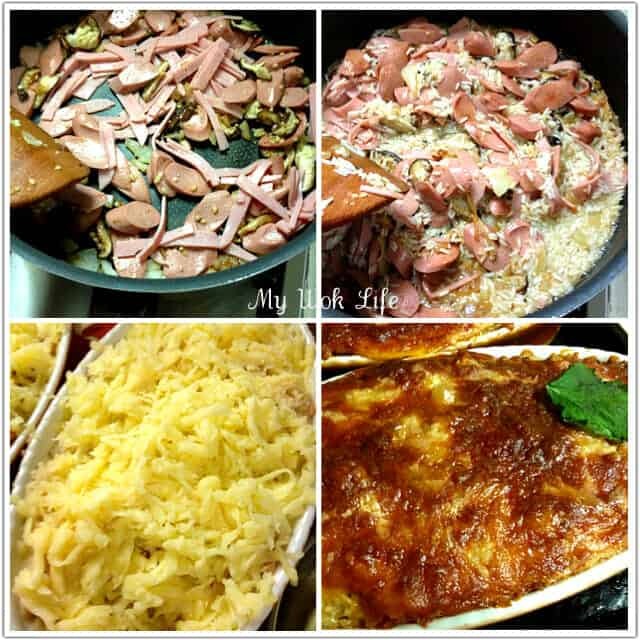 do you have a recipe for bolognese or tomato based cheese baked rice? Yes. Let me cook it and post the recipe for you soon.